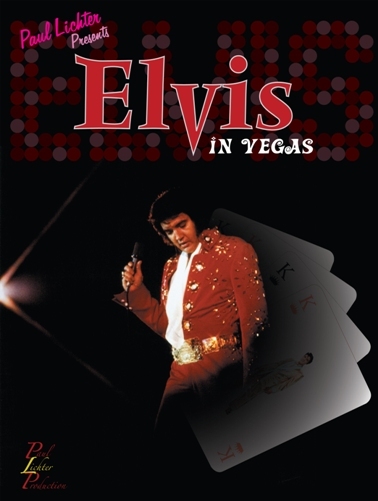 VIVA LAS VEGAS - Book review - Elvis Information Network. For many it's a mouth watering delight......Elvis and Ann-Margret together in one of the King's most successful celluloid offerings, Viva Las Vegas. The sight of two of Hollywood's most attractive stars in the one film could not miss and its success was amplified by the sizzling on and off screen chemistry between the two leads. To celebrate this great film, prolific Elvis book publisher, Joe Tunzi, has joined forces with Paul Lichter, one of the world's biggest Elvis collectors, to present a salivating array of visual treats relating to the film. VIVA LAS VEGAS Swingin' - Singin' - Lovin' is the result and in keeping with recent hardcover releases from JAT Productions it is a glorious book. Undoubtedly it is the hundred plus visuals from Paul Lichter's Elvis Photo Archives which dominate the book. An eye-catching mix of film stills, off-stage candids, publicity shots, recording studio photos and miscellaneous film and tape legend material, there is a treasure trove of well known and rare images featured throughout the book's 120 pages. Vibrant color accentuates many of the King's cool wardrobe items. 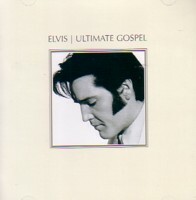 Standout publicity shots include Elvis in red and yellow jackets and there are numerous full page visuals of the the King and the 'It Girl' together to whet many a fan's interest. 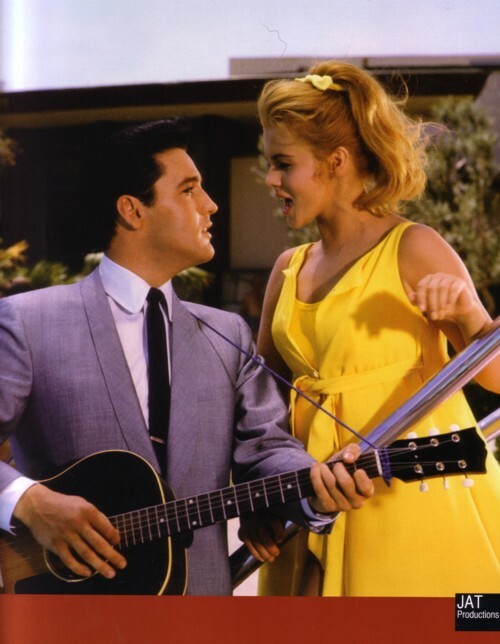 Similarly, the brilliant color makes Ann-Margret literally shine in her yellow one piece bathing costume and robe. Eye candy anyone? Other visual highlights include a wonderfully expressive photo of Ann-Margret with Elvis, between scenes, with mouth wide open and hands gesturing around her face; and a set of very rare photos of Elvis with fans at the 'Casbar Theatre', 'Congo Room' and 'Hotel Sahara'. The photos vary from sublime full page images to other mostly two and three images to a page montages. Many of the full page photos are good enough to frame. These include many of the publicity shots, the color wedding photos and several of Elvis and Ann-Margret gyrating together on stage. 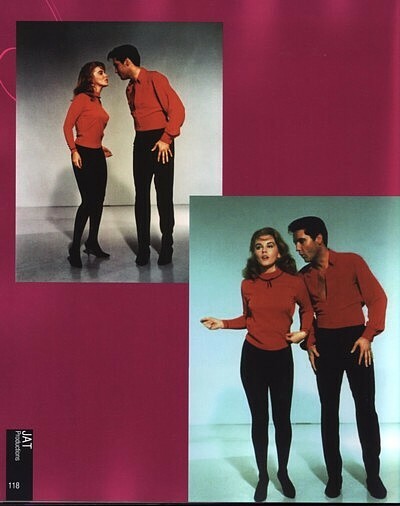 Right: While most Viva las Vegas fans will be familiar with the "yellow jacket" publicity dancing photos of Elvis and Ann-Margret, the rare "red top" images are just some of the photos that make this book very impressive. A neat device was to include with relevant images the bottom half of a vinyl record with the title for each of the songs in the film. Talk about setting the scene! Most of the visuals are nice and clear with only a few being a little fuzzy. Amusingly, because of the clarity of the visuals, it is very evident which of the outdoor scenes were actually filmed against a backdrop on a film stage. Screenwriter, Sally Benson, came up with a simple charming plot. In that music is the main thrust of Viva Las Vegas it's interesting to examine the way each song was featured. 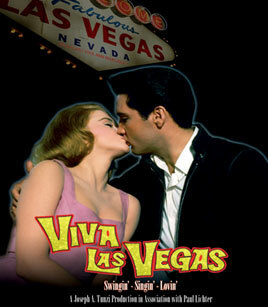 Viva Las Vegas begins with the samba-tinged title tune being played over a montage of the original Las Vegas Strip. Filmed at night this sequence gives us a nice indication of what the city looked like at the time. A sensational smoochy contact-sheet from a publicity shoot. It is amazing that Elvis an Ann-Margret were so obvious in front of the camera. The book includes plenty of photographs of Ann-Margret and Elvis that leave you with no doubt that there was some real hot lovin’ going on! The excellent book layout and design was done by Paul's son, Tristan-Elvis Lichter. The page design allows the photos to be the central focus. Importantly, the hardcover format with sewn in pages means the book will not fall apart in a few years like many paperback releases. Verdict: Another winner from the Tunzi stable with center stage taken by the many high quality, glossy stills from Paul Lichter's Elvis Photo Archives. Recommended. 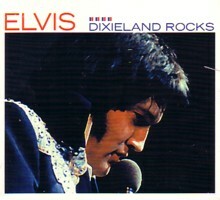 Happy Birthday Elvis 2010 !! !